Peter Robinson engages Americas master novelist in a conversation that ranges from the death of the American novel to the charming aristocracy that seeks to dictate literary standards to the intersection of culture and the latest findings in neuroscience. Along the way, Tom Wolfe reaffirms his place as the preeminent chronicler of the changing American scene. An hour conversation with sculptor Richard Serra about his exhibition at The Gagosian Gallery in New York City, his use of synthetic materials in art and his career in film (2001). Although I pride myself on having wide-ranging taste in art, there are some artists that consistently rub me the wrong way. There is one major American sculptor in particular whose work I don’t care for. Before I go further I should clarify something: I don’t dislike Richard Serra personally. I had the chance to meet him when an exhibition of his was being installed at a gallery where I worked in the early 1980s, and he was very pleasant to me. He was immensely intelligent, and I enjoyed having the chance to drive him on a few errands and hear him talk about art. Serra has a temper — I watched him chew out the photographer who had been hired to document his installation — but I figure that “fiery” can be sign of integrity. As I gained a generally positive impression of Richard Serra the man, the two massive pieces of battleship armor that I saw installed in the gallery floor were charming me less than he was. Over time, and after periodically viewing many more Serra installations, I still haven’t warmed up to Serra the artist. I think that Serra’s work is vastly overrated, pompous and inhuman. I think that most of the credit for the presence found in Serra’s steel pieces should go to the foundry in Germany that fabricates them. Serra strikes me as an aesthetic bully whose installations are imposing to the point of actually intimidating the public meant to appreciate them. I do, however, think that Serra’s large steel pieces sometimes make nice backgrounds for photographs of people. So do rusting battleships. OK, my opinion is out there now: I’m in trouble, right? By airing out a private judgement in public I have given you — the reader — the opportunity to judge my taste against your own opinions and biases. If you agree with me you respect me more and if you disagree we are now at odds. As human beings we are always most comfortable around others who share our taste. We are naturally insecure around those who disagree with us, and when the matter involves taste things get quite personal. Taste is art is about a kind of freedom: the freedom of preference. Each of us likes what we like and nobody can or should define our taste for us. If a student tells me “I love Thomas Kinkade!” I try to keep my disdain in check and congratulate them on having a passion for art. At the same time, I also get ready to offer them a broader range of art to look at. I believe that the proper way to teach art appreciation is to expose not to indoctrinate. When a work of art that we previously found puzzling, unsatisfying or even repellent suddenly enchants us, an internal boundary is erased. According to the British writer and philosopher G. K. Chesterton, all art involves “drawing a line somewhere.” Challenging works of art dare us to cross the line of our preference and to even change our notion of what may or may not be art at all. Expanding the boundaries of taste offers an exciting prospect: new pleasures. That is high praise from a man that had extraordinary erudition. Just re-reading it activates some insecurity on my part: could I possibly be completely wrong about Richard Serra? Then again, one’s taste is never “wrong,” even though people will tell you that it is. Of course, this blog isn’t about Richard Serra. What I want to write about is the mutability of taste. Whenever I lay out my own opinion about art I do so realizing that my taste is not stable: it’s development is an ongoing project. I have written enough to sometimes be called a critic, but I’m too aware of my own intellectual capriciousness to take on that responsibility just yet. I worry that declaring myself a critic would result in more people being critical of me. Those comments hit home because I am an artist turned writer. And yes, there is something very appealing about becoming a larger fish in the art pond and having the chance to give patronizing advice and pronounce judgment. Having my brief public rant about Richard Serra was very satisfying: it let me, the failed artist, connect with a nice juicy revenge fantasy. Frankly, it also felt good to disagree with Robert Hughes, who became a critic after “failing” as a painter. In other words, some of the same things that have made me hostile to Serra’s works — their uncompromising force and intimidating presence — are directly connected to the aspects that Ed found so moving and profound. Ed’s blog in itself is so beautiful that it made me promise myself to go see the Serra show. Part of me hopes that Serra’s works will live up to Ed’s praise. Part of me also hopes I don’t like the show, so I won’t have to change my mind. Richard Serra (born November 2, 1939) is an American minimalist sculptor and video artist known for working with large-scale assemblies of sheet metal. Serra was involved in the Process Art Movement. He lives and works in Tribeca, New York, and on Cape Breton Island in Nova Scotia. Serra studied painting in the M.F.A. program at the Yale University School of Art and Architecture between 1961 and 1964. Fellow Yale Art and Architecture alumni of the 1960s include the painters, photographers, and sculptors Brice Marden, Chuck Close, Nancy Graves, Gary Hudson and Robert Mangold. He claims to have taken most of his inspiration from the artists who taught there, most notably Philip Guston and the experimental composer Morton Feldman. With Albers, he worked on his book Interaction of Color (1963). He continued his training abroad, spending a year each in Florence and Paris. In 1964, he was awarded a Fulbright Scholarship for Rome, where he lived and worked with his first wife, sculptor Nancy Graves. Since then, he has lived in New York, where he first used rubber in 1966 and began applying his characteristic work material lead in 1968. In New York, his circle of friends included Carl Andre, Walter De Maria, Eva Hesse, Sol LeWitt, and Robert Smithson. At one point, to fund his art, Serra started a furniture-removals business, Low-Rate Movers, and employed Chuck Close, Philip Glass, Spalding Gray, and others. Serra married art historian Clara Weyergraf in 1981. He is the brother of famed San Francisco trial attorney Tony Serra. In 1966, Serra made his first sculptures out of nontraditional materials such as fiberglass and rubber. Serra’s earliest work was abstract and process-based made from molten lead hurled in large splashes against the wall of a studio or exhibition space. In 1967 and 1968 he compiled a list of infinitives that served as catalysts for subsequent work: “to hurl” suggested the hurling of molten lead into crevices between wall and floor; “to roll” led to the rolling of the material into dense, metal logs. He began in 1969 to be primarily concerned with the cutting, propping or stacking of lead sheets, rough timber, etc., to create structures, some very large, supported only by their own weight. His “Prop” pieces from the late 1960s are arranged so that weight and gravity balance lead rolls and sheets. Cutting Device: Base Plate Measure (1969) consists of an assemblage of heterogeneous materials (lead, wood, stone and steel) into which two parallel cuts have been made and the results strewn around in a chance configuration. In Malmo Role (1984), a four-foot-square steel plate, one and a half inches thick, bisects a corner of the room and is prevented from falling by a short cylindrical prop wedged into the corner of the walls. Still, he is better known for his minimalist constructions from large rolls and sheets of metal (COR-TEN-Steel). Many of these pieces are self-supporting and emphasize the weight and nature of the materials. Rolls of lead are designed to sag over time. Around 1970, Serra shifted his activities out of doors and became a pioneer of large-scale site-specific sculpture. Serra often constructs site-specific installations, frequently on a scale that dwarfs the observer. His site-specific works challenge viewers’ perception of their bodies in relation to interior spaces and landscapes, and his work often encourages movement in and around his sculptures. Most famous is the “Torqued Ellipse” series, which began in 1996 as single elliptical forms inspired by the soaring space of the early 17th century Baroque church San Carlo alle Quattro Fontane in Rome. Made of huge steel plates bent into circular sculptures with open tops, they rotate upward as they lean in or out. Serra usually begins a sculpture by making a small maquette (or model) from flat plates of steel at an inch-to-foot ratio: if the piece is going to be 40 feet long he starts with a 40-inch model. He usually makes the models in lead as it is “very malleable and easy to rework continuously”; however, the Torqued Ellipses were started with wooden models. He then consults a structural engineer, who specifies how the piece should be made to retain its balance and stability. The steel pieces are fabricated in Germany and installed by Budco Enterprises, a Long Island rigging company with which he has worked for more than 30 years as one generation rolled into another. As Cor-Ten steel was designed to acquire a dark, even patina of rust over time, the exterior steel sculptures go through an initial oxidation process, but after 8–10 years, the patina of the steel settles to one color (mostly brown) that will remain relatively stable over the piece’s life. Serra’s first larger commissions were mostly realized outside the United States. Shift (1970–72) consists of six walls of concrete zigzag across a grassy hillside in King City, Ontario. 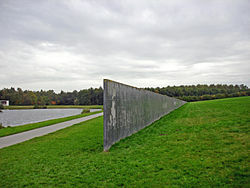 Spin Out (1972–73), a trio of steel plates facing one another, is situated on the grounds of the Kröller-Müller Museum in Otterloo, Holland. (Schunnemunk Fork (1991), a work similar to that of his in the Netherlands can be found in Storm King Art Center in Upstate New York.) Part of a series works involving round steelplates, Elevation Circles: In and Out (1972–77) was installed at Schlosspark Haus Weitmar in Bochum, Germany. 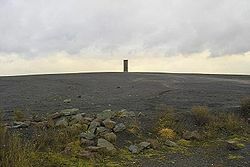 For documenta VI (1977), Serra designed Terminal, four 41-foot-tall trapezoids that form a tower, situated in front of the main exhibition venue. After long negotiations, accompanied by violent protests, Terminal was purchased by the city of Bochum and finally installed at the city’s train station in 1979. Carnegie (1984–85), a 39-foot-high vertical shaft outside the Carnegie Museum of Art in Pittsburgh, received high praise. 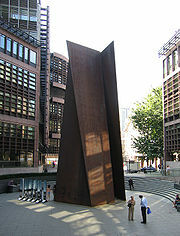 Similar sculptures, like Fulcrum (1987), Axis (1989), and Torque (1992), were later installed in London’s Broadgate, at Kunsthalle Bielefeld, and at Saarland University, respectively. Initially located in the French town of Puteaux, Slat (1985) consists of five steel plates – four trapezoidal and one rectangular – each one roughly 12 feet wide and 40 feet tall, that lean on one another to form a tall, angular tepee. Already in 1989 vandalism and graffiti prompted that town’s mayor to remove it, and only in December 2008, after almost 20 years in storage, Slat was re-anchored in La Défense. Because of its weight, officials chose to ground it in a traffic island behind the Grande Arche. In 1981, Serra installed Tilted Arc, a gently curved, 3.5 meter high arc of rusting mild steel in the Federal Plaza in New York City. There was controversy over the installation from day one, largely from workers in the buildings surrounding the plaza who complained that the steel wall obstructed passage through the plaza. A public hearing in 1985 voted that the work should be moved, but Serra argued the sculpture was site specific and could not be placed anywhere else. Serra famously issued an often-quoted statement regarding the nature of site-specific art when he said, “To remove the work is to destroy it.” Eventually on March 15, 1989, the sculpture was dismantled by federal workers and taken for scrap. In May 1989 the piece was cut into three parts and consigned to a New York warehouse where it has languished ever since. William Gaddis satirized these events in his 1994 novel A Frolic of His Own. Serra continues to produce large-scale steel structures for sites throughout the world, and has become particularly renowned for his monumental arcs, spirals, and ellipses, which engage the viewer in an altered experience of space. In particular, he has explored the effects of torqued forms in a series of single and double-torqued ellipses. He was invited to create a number of artworks in France: Philibert et Marguerite in the cloister of the Musée de Brou at Bourg-en-Bresse (1985); Threats of Hell (1990) at the CAPC (Centre d’arts plastiques contemporains de Bordeaux) in Bordeaux; Octagon for Saint Eloi (1991) in the village of Chagny in Burgundy; and Elevations for L’Allée de la Mormaire in Grosrouvre (1993). Alongside those works, Serra designed a series of forged pieces including Two Forged Rounds for Buster Keaton (1991); Snake Eyes and Boxcars (1990-1993), six pairs of forged hyper-dense Cor-Ten steel blocks;, Ali-Frazier (2001), two forged blocks of weatherproof steel; and Santa Fe Depot (2006). In 2000 he installed Charlie Brown, a 60-foot-tall sculpture in atrium of the new Gap Inc. headquarters in San Francisco. To encourage oxidation, or rust, sprinklers were initially directed toward the four German-made slabs of steel that make up the work (see External links). Working with spheroid and toroid sections for the first time, Betwixt the Torus and the Sphere (2001) and Union of the Torus and the Sphere (2001) introduced entirely new shapes into Serra’s sculptural vocabulary. Wake (2003) was installed at the Olympic Sculpture Park in Seattle, with its five pairs of locked toroid forms measuring 14 feet high, 48 feet long and six feet wide apiece. Each of these five closed volumes is composed of two toruses, with the profile of a solid, vertically flattened S.
Named for the late Joseph Pulitzer, Jr. (1913-1993), the rolled-steel elliptical sculpture Joe (2000) is the first in Serra’s series of “Torqued Spirals”. It is, The 42.5-ton piece T.E.U.C.L.A., another part of the “Torqued Ellipse” series and Serra’s first public sculpture in Southern California, was installed in 2006 in the plaza of UCLA‘s Eli and Edythe Broad Art Center. That same year, the Segerstrom Center for the Arts in Costa Mesa installed Serra’s Connector, a 66-foot-tall towering sculpture on a pentagonal base, on its plaza. Another famous work of Serra’s is the mammoth sculpture Snake, a trio of sinuous steel sheets creating a curving path, permanently located in the largest gallery of the Guggenheim Museum Bilbao. In 2005, the museum mounted an exhibition of more of Serra’s work, incorporating Snake into a collection entitled The Matter of Time. The whole work consists of eight sculptures measuring between 12 and 14 feet in height and weighing from 44 to 276 tons. Already in 1982-84, he had installed the permanent work La palmera in the Plaça de la Palmera in Barcelona. He has not always fared so well in Spain, however; also in 2005, the Centro de Arte Reina Sofía in Madrid announced that the 38-tonne sculpture Equal-Parallel/Guernica-Bengasi (1986) had been “mislaid”. In 2008, a duplicate copy was made by the artist and displayed in Madrid. In spring 2005, Serra returned to San Francisco to install his first public work, Ballast (2004), in that city (previous negotiations for a commission fell through) – two 50-foot steel blades in the main open space of the new University of California, San Francisco (UCSF) campus. Weighing 160 tons, placing the work in its Mission Bay location posed serious challenges, since it is, like many parts of San Francisco, built on landfill. From May 7 to June 15, 2008 Serra showed his installation Promenade at the Grand Palais, Paris. “A radical, poetic landscape of steel, minimalist yet full of movement.” Serra was the second artist, after Anselm Kiefer, to be invited to fill the 13,500 m² nave of the Grand Palais with a group of new works created specially for the event. Birmingham City Council is currently considering a proposal for an outdoor installation by Serra in front of their new Library of Birmingham to replace the destroyed Forward sculpture by Raymond Mason in Centenary Square. In December 2011, Serra unveiled his sculpture 7 in Doha, Qatar. The sculpture, located at an artificial plaza in Doha harbour, is composed of seven steel sheets and is 80-foot high. The sculpture was commissioned by the Qatar Museums Authority and took one year to be built. In the past Serra has dedicated work to Charlie Chaplin, Greta Garbo, Marilyn Monroe, Buster Keaton, the German filmmaker Rainer Werner Fassbinder and the art critic David Sylvester. For the city of Goslar, Serra designed Goslar Memorial (1981). In 1987, he created Berlin Junction as a memorial to those who lost their lives to the Nazis’ genocide program. First shown at the Martin-Gropius-Bau, the sculpture was installed permanently at the Berliner Philharmonie in 1988. For the United States Holocaust Memorial Museum, he designed Gravity, a 10-inch-thick, 10-foot-square standing slab of steel, in 1993. After initially joining with architect Peter Eisenmann to submit a design for Berlin’s Memorial to the Murdered Jews of Europe, Serra abruptly pulled out of the project for “personal and professional reasons” in 1998. Serra was one of the four performers in the premiere of the Steve Reich piece Pendulum Music on May 27, 1969 at the Whitney Museum of American Art. The other performers were Michael Snow, James Tenney and Bruce Nauman. Hand Catching Lead (1968) was Serra’s first film and features a single shot of a hand in an attempt to repeatedly catch chunks of material dropped from the top of the frame. He also produced the classic 1973 short film Television Delivers People, a critique of the corporate mass media with elevator music as the soundtrack. In Boomerang (1974), Serra taped Nancy Holt as she talks and hears her words played back to her after they have been delayed electronically. The host of Serra’s 1974 parody game show, Prisoners’ Dilemma, explains that the loser will spend six hours alone in a basement – “that’s about the length of the average boring artist’s videotape”. 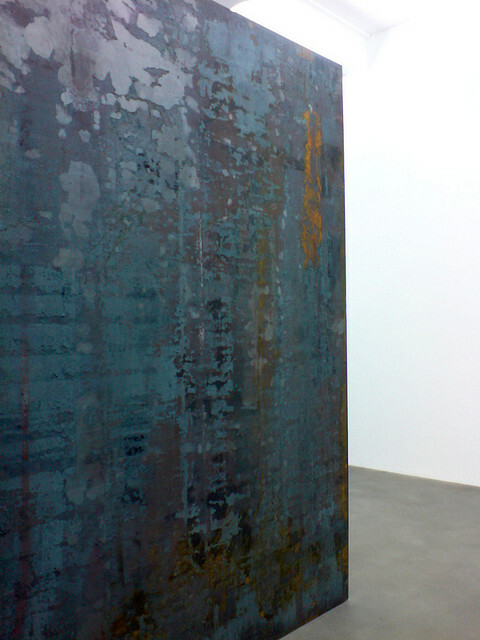 Serra has made a number of films concerning the manufacture and use of his favorite material, steel. Railroad Turnbridge (1976) is a series of shots taken on the Burlington and Northern bridge over the Willamette River near Portland, Oregon, as it opens to let a ship pass. In Steelmill/Stahlwerk, a 1979 documentary made in collaboration with Clara Weyergraf, Serra explores the physical construction of an art piece and at the same time examines the lives of the steelmill. These films can be viewed in a room off the Arcelor gallery in the Guggenheim museum in Bilbao. Serra appears in Matthew Barney‘s 2002 film Cremaster 3 as Hiram Abiff (“the architect”), and later as himself in the climactic The Order section – the only part of a Cremaster film commercially available on DVD. Since 1971, Serra has focused not only on sculptural works, but also on large-scale drawings on handmade Hitomi paper or Belgian linen using various techniques. In the early 1970s he drew primarily with ink, charcoal, and lithographic crayon on paper. His primary drawing material has been the paintstick, a wax-like grease crayon. Serra melts several paintsticks to form large pigment blocks. The drawings do not function as preparatory studies but typically come after a sculpture has been completed, as a form of notating its spatial relationships. Drawings After Circuit (1972), for instance, followed an installation for documenta of four huge steel plates (8 by 24 feet each) jutting in from the corners of a room, stopping short of meeting in the center. In the mid-1970s, Serra made his first “Installation Drawings” — monumental works on canvas or linen pinned directly to the wall and thickly covered with black paintstick, such as Abstract Slavery (1974), Taraval Beach (1977), Pacific Judson Murphy (1978), and Blank (1978). The drawings Serra has executed since the 1980s continue the experiments with innovative techniques but are less monumental physically. In the late 1980s he explored how to further articulate the tension of weight and gravity by placing pairs of overlapping sheets of paper saturated with paintstick in horizontal and vertical compositions, often working on the floor and using a mesh screen as an intermediary between the gesture and the transfer of pigment to the paper. At the 2006 Whitney Biennial, Serra showed a simple litho crayon drawing of an Abu Ghraib prisoner with the caption “STOP BUSH.” This image was later used by the Whitney Museum to make posters for the Biennial. The posters featured an altered version of the text that read “STOP B S .” Serra also created a variation on Goya‘s Saturn Devouring His Son featuring George W. Bush‘s head in place of Saturn’s. This was featured prominently in an ad for the website pleasevote.com (now defunct) on the back cover of the July 5, 2004 issue of The Nation. For his 2011 exhibition of drawings at the Metropolitan Museum of Art, Serra reworked some of his earlier pieces on paper. Some of the drawings that he reworked had been damaged or destroyed, and the artist recreated them specifically for the show. The museum hinted at this by labelling the works with two dates: that of the original and that of the reworked version. According to Serra, however, it is not important whether audiences know which version they are seeing. Serra had his first solo exhibitions at the Galleria La Salita, Rome, 1966, and in the United States at the Leo Castelli Warehouse, New York. The Pasadena Art Museum organized a solo exhibition of Serra’s work in 1970. Serra has since participated in Documentas 5 (1972), 6 (1977), 7 (1982), and 8 (1987), in Kassel, the Venice Biennales of 1984 and 2001, and the Whitney Museum of American Art’s Annual and Biennial exhibitions of 1968, 1970, 1973, 1977, 1979, 1981, and 1995. Serra was honored with further solo exhibitions at the Kunsthalle Tübingen, Germany, in 1978; the Musée National d’Art Moderne, Paris, in 1984; the Museum Haus Lange, Krefeld, Germany, in 1985; and the Museum of Modern Art, New York, in 1986. 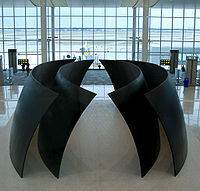 From 1997 to 1998 his Torqued Ellipses (1997) were exhibited at and acquired by the Dia Center for the Arts, New York. In 2005 eight major works by Serra were installed permanently at Guggenheim Museum Bilbao. In the summer of 2007 the Museum of Modern Art presented a retrospective of Serra’s work in New York. Intersection II (1992–1993) and Torqued Ellipse IV (1998) were included in this show along with three new works. The retrospective consisted of 27 of Serra’s works, including three large new sculptures made specifically for the second floor of the museum, two works in the garden, and earlier pieces from the 1960s through the 1980s. A retrospective is an occasion to reflect and take stock, but it’s double edged in that it puts me into a nostalgic relationship to my own history, which I’d rather not dwell upon. The rearview mirror perspective is not one that I’d take if there wasn’t a retrospective pending. I would rather think about the work that I am doing and the work that’s in front of me to do and not have to look over my shoulder. It’s obvious to me that I am not the same person that I was 40 years ago, nor are the issues that I am concerned with the same. A retrospective might give the impression of a seamless linearity of development, but my work does not evolve that way. It evolves in fits and starts. Oftentimes, the solution to a problem leads to an altogether different idea. Major presentations of Serra’s graphic oeuvre include exhibitions at the Bonnefantenmuseum, Maastricht, in 1990; at Serpentine Gallery, London, in 1992; and at Kunsthaus Bregenz, Bregenz, in 2008. In 2011, the Metropolitan Museum of Art, the San Francisco Museum of Modern Art and the Menil Collection hosted a retrospective exhibit focusing on Serra’s drawings, tracing the development of his drawing as an art form independent from yet linked to his sculptural practice. Serra’s work can be found in many international public and private collections, including the Museum of Modern Art and the Solomon R. Guggenheim Museum in New York, the Los Angeles County Museum of Art, and the San Francisco Museum of Modern Art. Since the early 1970s, Serra has completed many private commissions, most of them funded by European patrons. Private commissions in the United States include sculptures for Eli Broad, Jeffrey Brotman, Peggy and Ralph Burnet (To Whom It May Concern, 1995), Gil Freisen, Alan Gibbs (Te Tuhirangi Contour, 1999-2001), Ivan Reitman, Steven H. Oliver (Snake Eyes and Boxcar, 1990–93), and Mitchell Rales. In 2006, Colby College acquired 150 works on paper by Serra, making it the second largest collection of Serra’s work outside of the Museum of Modern Art in New York. Serra’s work was featured on BBC One in “Imagine…Richard Serra: Man of Steel” on Tuesday November 25, 2008 which described him as “Sculptor and giant of modern art Richard Serra discusses his extraordinary life and work. A creator of enormous, immediately identifiable steel sculptures that both terrify and mesmerise, Serra believes that each viewer creates the sculpture for themselves by being within it.” Contributors include Chuck Close, Philip Glass and Glenn D Lowry, Director of MoMA. He was interviewed at length by the BBC’s Alan Yentob. Serra was awarded honorary degrees of Doctor of Fine Arts by Williams College in 2008; the California College of Arts and Crafts, the Nova Scotia College of Arts and Design, Yale University, and Universidad Pública de Navarra (2009); and by Harvard University in 2010. In 1975, he received the Skowhegan Medal for Sculpture. He was awarded the Goslarer Kaiserring in 1981, and in 1991, he won the Wilhem Lehmbruck Prize for Sculpture in Duisburg. In 1993, Serra was elected a fellow of the American Academy of Arts and Sciences. He is also a member of the American Academy of Arts and Letters and the Akademie der Künste (Germany), as well as having been named member of the Orden Pour le Mérite für Wissenschaften und Künste (2002) in Germany and Commandeur de L’Ordre des Arts et des Lettres (2008) in France. In 1994, he was honored with the Praemium Imperiale. Along with the debate surrounding Tilted Arc, Serra’s public image has been further affected by two tragic accidents. In November 1971, 34-years old Raymond Johnson, a laborer installing Serra’s Sculpture No. 3 at the Walker Art Center in Minneapolis, was crushed to death when a two-ton steel plate toppled over on him. A subsequent lawsuit absolved the artist and museum of blame. In October 1989, another worker lost a leg while dismantling a 16-ton Serra sculpture at the Leo Castelli Gallery. In 2002, an installation titled Vectors was to be built at the California Institute of Technology from the bequest of Eli Broad. The proposed 80-ton piece, to be four steel plates of similar material as Tilted Arc zig-zagging across one of the few green spaces at the university, met significant opposition by the student body and professors as being a “‘derivative” rehash of earlier works, or an ‘arrogant’ piece that [belied] Institute values.” The piece was never installed. Only a few of Serra’s top auction prices are for sculpture; the rest are for his works on paper. In 2001, an untitled, 1984 curved steel wall was sold for $1.2 million at Sotheby’s in New York. The current record auction price for a Serra sculpture was paid at Sotheby’s in 2008, where 12-4-8, a 1983 work consisting of three steel plates, sold for $1.65 million. By 1969 Serra was regularly showing his works at the Leo Castelli Gallery and receiving a regular gallery stipend of $500 a month. Galerie m in Bochum, Germany, has represented Serra in Europe since 1975. Gagosian Gallery became the artist’s primary dealer in 1991 after opening a space in New York’s Soho district with large entryways and a supported foundation. Since 1972, with publisher Gemini G.E.L. in Los Angeles, Serra has released 170 different prints, 120 of them since 1990.